As the name suggests, Monumento La Clava is a beautiful monument at the northern entrance of the city of Canete. 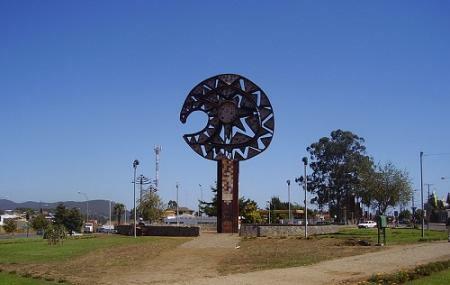 This monument is also known as "Sculpture tribute children the Mapuche people" because it contains the printing of 3,000 hands of children in the region. "The Clava" is a badge of command of the Mapuche people. You can sit in the garden nearby and have a good look at the monument. A wonderful place to get photographed! Want to plan a DIY trip? Use CaÃÃÃ‚ƒÂ±ete trip planner for the same. You can enjoy a comfortable stay in the city by booking the best hotels in CaÃÃÃ‚ƒÂ±ete like Complejo Pehuen Lago Lanalhue and Hostal El RincÃÃÃ‚ƒÂ³n Viejo. Create your own CaÃÃÃ‚ƒÂ±ete vacation packages or choose from the ones made by travel experts. Also explore the best ways for how to reach CaÃÃÃ‚ƒÂ±ete. Get here on foot from Shell or Copec. Love this? Explore the entire list of places to visit in Cañete before you plan your trip. Fancy a good night's sleep after a tiring day? Check out where to stay in Cañete and book an accommodation of your choice. Buen lugar para descansar, está bien ubicada.